Maybe you thought I am only interested in cats and books and writing and wine food, but my love of local history was fueled by the vintage photographs (that are now antiques) and glass negatives my grandfather gave me. Many of them are interesting shots of locations and people in actions, but more of them are portraits and Grandpa assigned names for every person he knew. Another thing that reinforced my history interest was that my father was a “collector” of old buildings, especially downtown. He would buy old unloved commercial properties and rent them out, usually to young people who wanted a start in business. Since my mother’s great-grandfather had built some of the old buildings in our city, I came to believe that I was meant to coordinate the family photos and documents and to see where the family fit into our hometown. I’ve documented some of the information I’ve uncovered on my other blog. But you know I’m also a poet and writer of the more lyrical sort. So it wasn’t enough for me to write blog posts about people long dead. Where the more typical family history research left off, I wanted to add the power of imaginative research. That’s when I started writing my Kin Types poems. These poems are meant to uncover and reveal the lives of women in my family who are long gone. But they could be women in anybody’s family. That’s what family history really should be: the history of the world as seen through the lives of “regular” individuals. The women in these poems endure difficulties and tragedies: the death of an infant, waiting to hear about the fate of a soldier brother, a clandestine abortion, emotional illness, inability to pursue art, a mysterious death, a horrific fire, and more. 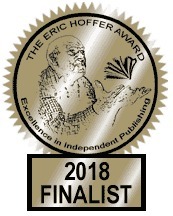 My chapbook also contains two prose pieces–flash nonfiction–and, strangely since all the poems are about women, the viewpoint of both these stories is from two men in my family. They are men who, in some ways, lived the male American immigrant story of the late 19th century. But they also had their own troubles and tragedies, and they too cried out (in my head, at least) to have their stories told. So it’s super exciting to announce that Finishing Line Press is publishing my book, and the stories of the people who have come before us will be available in poems and lyrical prose. Kin Types will be available for pre-order soon, so stay tuned! When I was in 3rd grade, my father built us a new house across town. At the time we lived in a small bungaranch (or it is ranchalow?) with a bomb shelter in the basement. In 2014 I wrote a post telling a bit about that bomb shelter. But this post is about our next house, sort of. My parents pored over architectural plans and made changes so that the house would be exactly what they wanted. It was a very well-constructed white aluminum siding and pink brick ranch with a full basement. My bedroom had a built-in desk, vanity, and bookshelves. We had a wood-paneled family room with fire place, and the living room had a wall of glass looking out to the woods behind. The house was 1,787 square feet (thanks, Trulia), which seemed of castle-like dimensions to me, particularly since I had most of that big basement to play in. My father had some help from subcontractors, but all the framing, the masonry, and extras like concrete walks and patio were done by my father. With me watching and fetching. When the house was almost completed, my father said my mother could choose the finishing touch. She could select the color of the front door. This is where I wish I could put a little cardboard swinging door over the answer so that you would have to guess first. Then you’d pull open the door (like on a page of a child’s cardbook book) and look in shock at the color. I remembered this story because I read Joey’s red door post on Thursday. But our door wasn’t red (which is always striking on white or gray houses). Our door was turquoise. Yup. Gulp. Maybe you love blue for decorating (I generally don’t as I prefer warmer colors). Or even turquoise. Or think it’s teal. But it’s not. Turquoise is turquoise, and I’m sorry but it is not an appropriate color for a door, even if the rest of the house is lovely. After we moved in, I noticed that the faux brown around my windows and doors had started to peel. I went up to the door and pulled at a paint shred that was just hanging. As I ripped it up, I saw the color underneath. It was turquoise. I am NOT kidding. The whole dang house is trimmed in store-bought turquoise trim. It’s not painted, but permanently coated with turquoise. And it defies paint on the top of it, which is why it peels all the time. When the gardener and I visited Michigan just before my father got sick, we went to see our old houses, schools, and haunts. This is a pic of the pretty house that no longer has a turquoise door. The only thing is, the house was more distinctive looking with the turquoise door. So maybe it’s all a matter of taste–not good or bad–but individual. Sadly, we only lived here for a year and a half because, even after all my father’s work on the house, we couldn’t afford to keep it. I’ve been really busy preparing everything the publisher needs for my chapbook, as well as doing a little work on the memoir. Fingers crossed on how all this goes . . . . I hope your Valentine’s Day is lovely even if you don’t have a special love. Find someone who would be warmed by a valentine–and deliver. Word of warning if you plan on a bouquet: if they have cats, try to stay away from lilies and carnations, which are toxic to cats. Roses and orchids are safe. And the fewer greens the better because nobody ever seems to know which ones are toxic and which ones aren’t. I left it lying on the living room floor and every time the gardener asked me why I hadn’t put it together yet, I explained how busy I am. (I am busy; that’s not a lie). My father had a workshop in our basement, and when I was younger than six I could often be found at his feet as he toiled at his building, fixing, creating. I loved the vise, the lathe, and all the different tools lined up by order of size on the pegboard over the workbench. When I was six, my father built a bomb shelter out of his workshop–and moved all his stuff out to the garage. This “poem start” (not a completed poem, but a first draft) documents that first workshop and its disappearance. A small, square space at the bottom of the steps. at the black and unknown winter. like the snow from a plow. by size like Goldilocks’ bears. flips it and pounds them back again. up the stairs and out to the garage. of sandpaper. Sleeping bag and painting. on the door he has just hung. The man toils over his bench in the garage now. The space heater is too dangerous. For a couple of years I couldn’t follow my father into the workshop the same way. The coziness and security were gone. But then we moved when I was eight and he created another wonderful workshop in the basement. He did so everywhere he ever lived. When my father was dying he gave me a beautiful set of wrenches to take home. As I tried to get through security at the airport, TSA took the wrench set from me. I never saw it again. After Dad’s funeral, family members and friends began plundering his workshop of its tools and gadgets. What place reminds you of your father or mother? My grandmother’s kitchen reminds me of her, and my other grandmother’s sewing room expresses her spirit. My grandfather’s place was his vegetable garden. For the rest of the summer, I plan to blog once a week instead of twice. I’m behind in my conversations with y’all and want to catch up! I’ve got some new eye problems, so I’m trying not to spend as much time on the computer, writing and reading, and then, after all, it is really really hot here. When I was just past thirty, I wrote a poem about my father. It took an Honorable Mention in a contest sponsored by The MacGuffin literary journal and judged by Diane Wakoski. I gave him a copy of the journal after it was published, and he acted like he always did when he didn’t know if he was being subtly criticized or if he should be flattered. I told him to be flattered. “Little old ladies” (his term) always loved my father. And I think that’s how he found some of his treasures. Maybe that is where my trunk came from, now that I think of it! gray-green Scout, still toddler-new and shiny. not knowing he wanted to see the decay of beauty. three-year-old garbage under cab seats. flexing the biceps of the Scout’s compact body. pushing it on and on way into dark. when breath-near the bottomless drop-off. the cold whirlpool, those obsidian depths. and snail shells that lake would ever spew out. The Scout began aging–coughing and slowing. the feel of destruction beneath our wheels. I couldn’t find an old photograph of the truck. I realized I don’t have many photos of those years. I’m not sure if my dad’s truck was #1 or #3 in the ad. I remember running away and getting out to the garage and seeing the Scout sitting there. The world looked exhausting from the garage, so I hauled my little laundry bag of clothes into the truck and fell asleep. 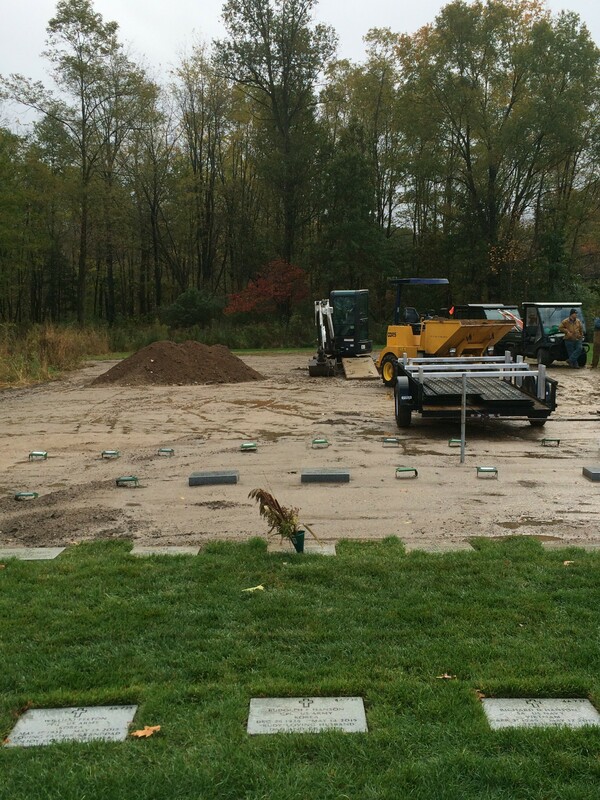 In the past, when we’ve visited Michigan, hubby and I visited his parents’ graves. 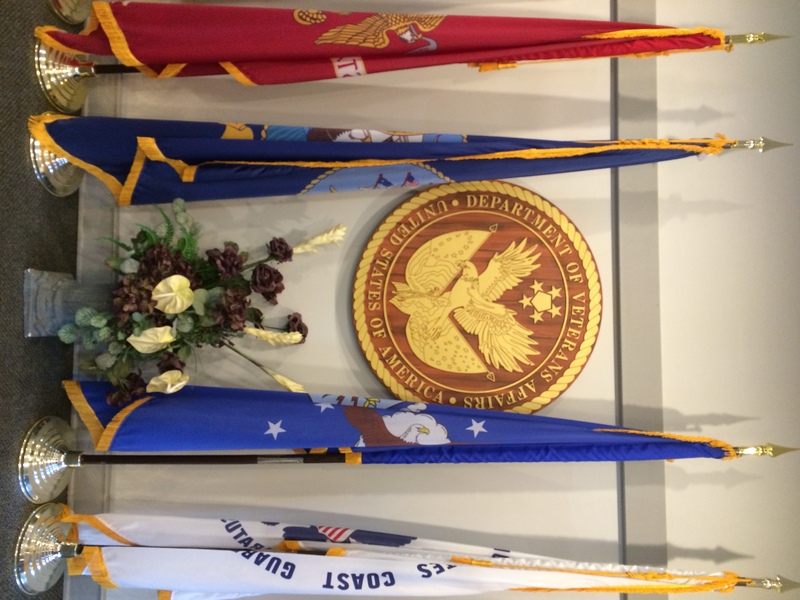 This time, we went with my mother to the veteran’s cemetery where my father is buried. When we got to Toronto, we also visited hubby’s grandparents’ graves. Sherri Matthews gave me the idea to write about our cemeteries. In Michigan, it was “pouring rain,” (is that a Michigan expression where pouring is used as an adjective meaning the rain is coming down in a downpour?) and we had left the umbrella back home. There is a government building on the very large property, and I stopped by to see if they had an umbrella to borrow. A nice young man ran about looking for one, even running out to his own car, but alas no umbrella. The cemetery feels very spacious because there are a lot of grounds with a curving road that cuts through. All the newer sections use flat markers, rather than gravestones, so the illusion is as if one is in a park. It looks clean and contemporary. When we got to my father’s section, the rain stopped. Graves are dug in the order of date of death, and many have come after my father. There is an institutional feel. Everything is large and impersonal. Big equipment just beyond my father’s grave is carving out room for more of our dead veterans, and in some cases, their spouses. 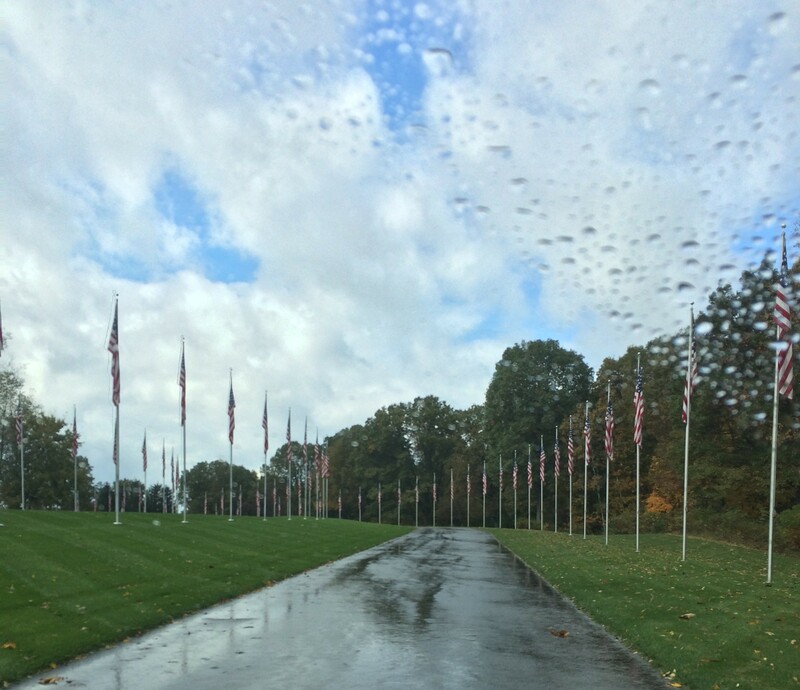 I’m grateful for the sacrifices of our veterans, and I am glad that this national cemetery is well cared for and in a beautiful setting. But it’s not where I would have liked my father to be buried. 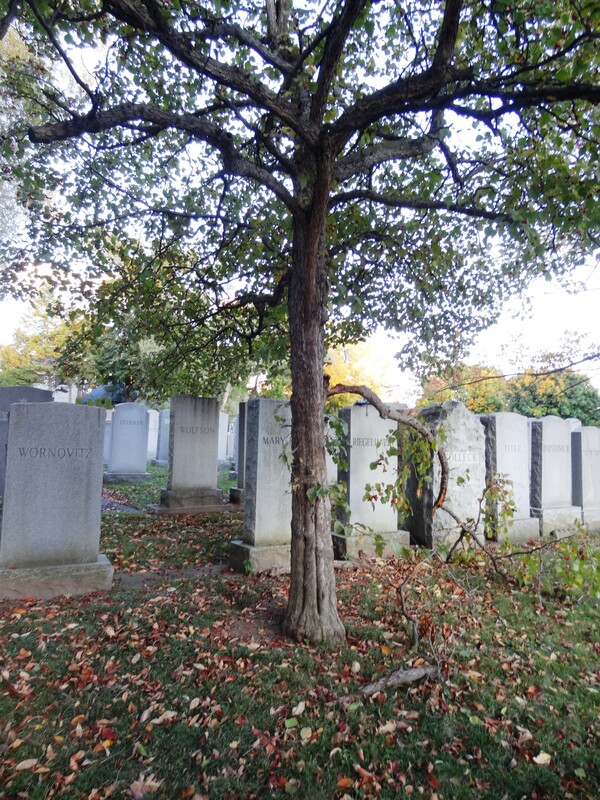 Originally, my parents had plots in a family section of a local cemetery. He would have had a regular headstone, where we would not have been limited by government rules. I also don’t like this idea for my mother because eventually (she’s in very good health and a very young 80, to be clear) she would have to go in the same grave with him, I believe. But near the end my father became more and more focused on his military service in the Korean War, and he changed his funeral and burial plans. 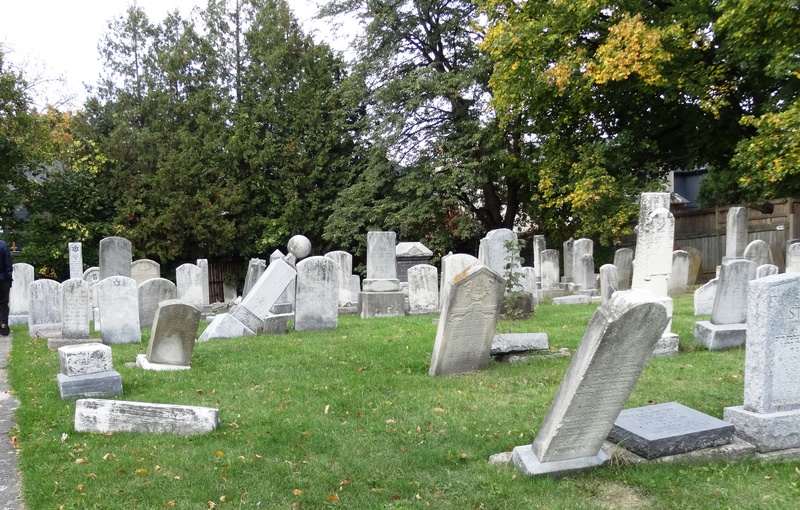 In Toronto, we found old traditional cemeteries. We were told the name of the Jewish cemetery where we would find hubby’s grandparents, so we followed my iPhone directions to get there. We were told it was on the north side of the road, and when we got there we discovered two cemeteries–both Jewish–one on each side of the road. We went to the appropriate side, but we couldn’t find any of the relatives, although we searched the names on every stone. I kept thinking we were in the wrong place because in general the dates appeared too old to me. Although there were a few where the deaths were past 2000, for the most part I thought these plots had been bought 100 years ago. 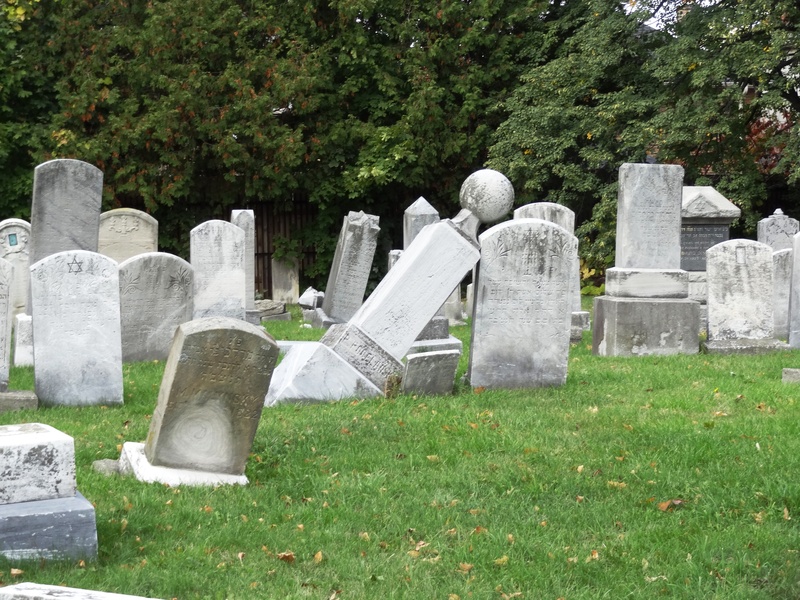 I felt bad about this cemetery because although someone was taking care of the grass, many stones were falling over. I didn’t know how much vandalism had to do with this and couldn’t help but wonder why nobody had fixed them! 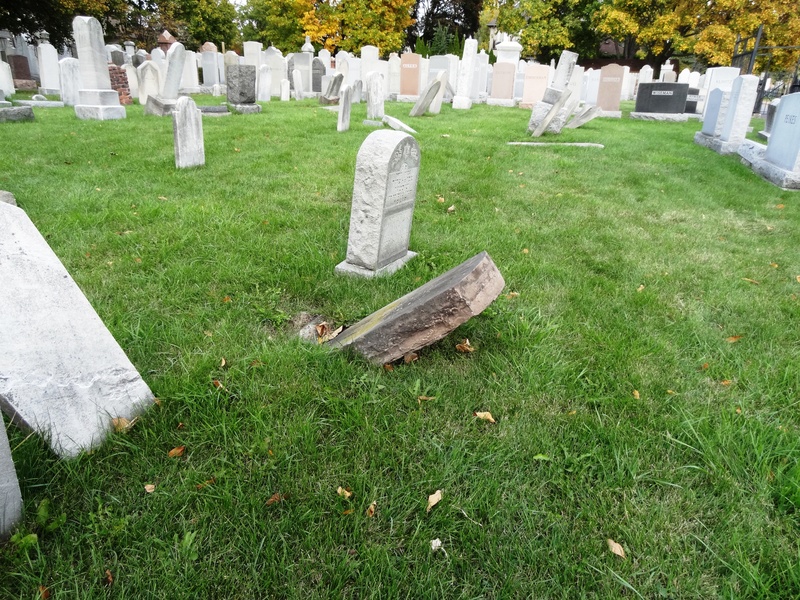 Jewish cemeteries are sometimes subjected to vandalism. Quite recently in France hundreds were vandalized. But these are old stones and maybe they have fallen over on their own? 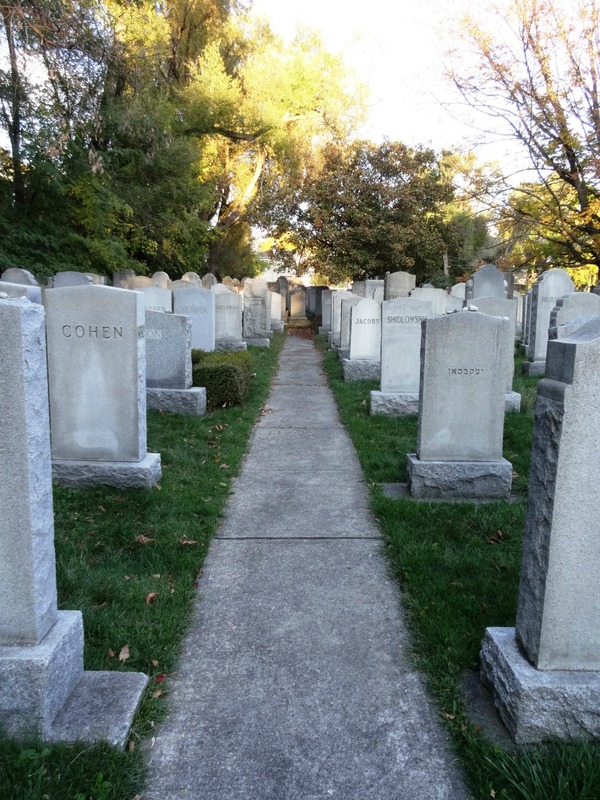 Eventually I wandered across the street to the very neat and orderly, but crowded, cemetery. I searched for some time, as the sun was moving down in the sky, creating shadows. Finally, hubby reached a cousin on the phone. He drove over and showed us that there was yet a third cemetery just up the street! That’s where we found hubby’s grandparents. Although this cemetery had the right feel and was quite beautiful and old, I won’t show you my photos of hubby’s grandparents’ gorgeous stones because his relatives are what hubby and I think of as superstitious, and I don’t want to annoy anyone. 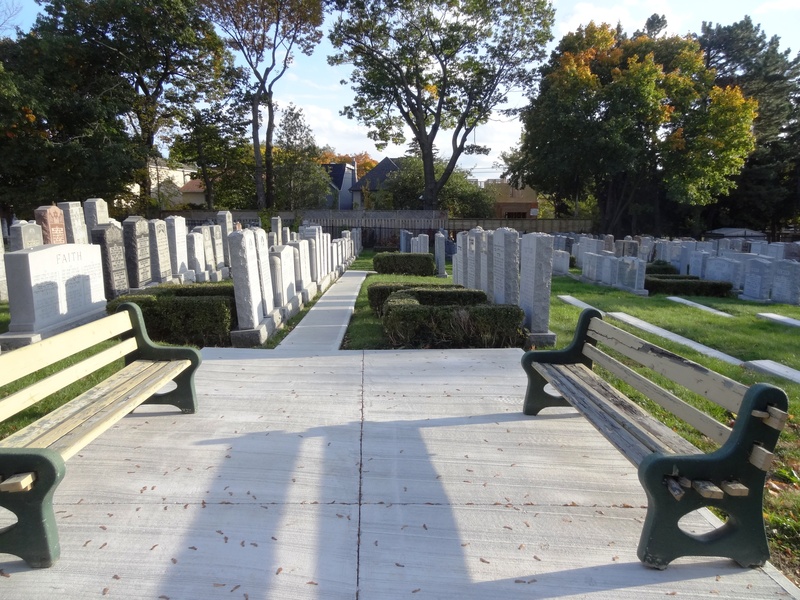 These Toronto cemeteries all had the look of big city cemeteries where the rows of gravestones are quite close together because land is precious.